In the humble neighbourhood of El Valle, in south-western Caracas, several hundred residents are gathered round in a community square, waiting for a meeting to start. One of the organisers picks up the microphone and starts addressing the crowd. "Why are you all here?" he asks them. "For Venezuela," they readily reply in unison before starting to sing the national anthem. "Glory to the brave nation, which shook off the yoke," they all chant. "Off with the chains! Off with the chains!" The anthem may reference Venezuela's colonial history, but the wording is particularly fitting for today's politics too. Venezuelans are joining in the modern-day fight to shake off President Nicolás Maduro's administration, a government that many blame for strangling the economy and people's lives. 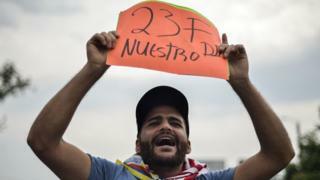 This meeting - and many similar events across the country - is being held ahead of a deadline set by opposition leader Juan Guaidó for humanitarian aid to be brought into the country from abroad. Mr Guaidó, head of the National Assembly and self-declared interim president, and his supporters are trying to gather a million volunteers. They want to spread the word about how important this humanitarian aid is. It does not sound like many in this meeting need convincing. When asked who wants to be a volunteer, everyone raises their hands. There is a feeling of optimism among many Venezuelans at the moment - an energy that has not existed in the country for a long time. And the hope that Saturday may be the start of a new path. Standing on the edge of the crowd are Liset Marin and her two children. Her husband is in Panama, where he has had to find work because of the crisis. "There have been so many struggles before and nothing's ever happened," she says, her voice breaking as she speaks. She apologises for being emotional, but says it is all too much. "This time, we feel things are evolving and there will be a change. We can only hope." Mr Maduro has accused the aid of being a Trojan horse, a US-orchestrated show and excuse to interfere in Venezuela. There is no doubt this has become a political issue. But Alberto Kabbabe, the director of a local charity helping to feed Venezuelans, says the fault lies squarely with the president. "He's the one who created the crisis here in Venezuela," he says. "The National Assembly asked for humanitarian aid in 2016, we've been asking in 2017 and 2018 and now in 2019. There are a lot of people dying because they don't have access to what they need, so the show has been created by Maduro's government." In parliament this week, Miguel Pizarro, the opposition politician in charge of humanitarian aid, also hit back at accusations from the international community that aid was being used for political ends. "We're also worried that for political reasons, people are dying in this country," he said in a speech where he pleaded with the armed forces to let the aid through. "And for political reasons, our surgeons don't have the right tools." Juan Guaidó's push to bring aid into the country is a clear strategy, experts say, and an understandable one. "This is an attempt to put Maduro in a difficult spot of his own making," says David Smilde, a senior fellow at the Washington Office on Latin America think-tank. "It's not crazy for him [Maduro] to think it's a Trojan horse, because very clearly this has been on the opposition's agenda. "It's a way of drawing international attention," he continues. "It's important to make that clear that this whole situation wouldn't exist if Maduro had said: 'OK opposition, you want to bring in some aid? Go for it.'" "I think that the intention is to dramatise the situation," says Michael Shifter of the Inter-American Dialogue think-tank in Washington. "It's certainly not the solution - and the solution won't come without a political change in Venezuela," he says, adding that this is a strategy aimed at winning the hearts and minds of officers. There is so much uncertainty around what will happen on Saturday. President Maduro still controls Venezuela's borders and in that respect has the upper hand. But many are looking to next week already. 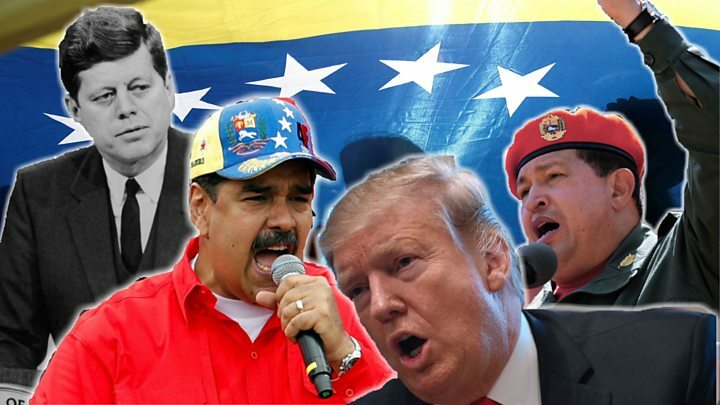 If the stand-off drags on, the fear is that this positive energy that has revived Mr Maduro's critics will wane, as will the interest of the international community, and that's what Juan Guaidó needs to achieve regime change. People want to know about a plan B - if indeed Mr Guaidó has thought of one. Otherwise, the hope here will soon turn to despair.